Infested Planet has no qualms crushing your gaming ego and leaving you stranded in the middle of an alien planet surrounded by overwhelming odds. As thousands of bugs come piling at you, there’s a moment of panic that forces you to grip your mouse and make one final push to separate yourself from the imminent threat of defeat. 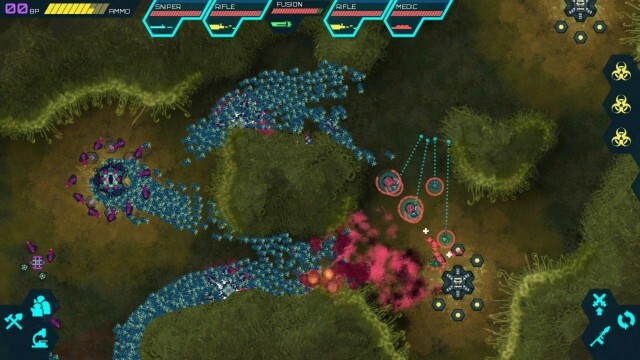 Players must dig deep into the game’s fusion of real-time strategy and tower defence to constantly adapt to a mutating alien threat, which strikes a fine balance between challenge and unjustifiable difficulty. The bug eradicating gameplay starts off small. Players direct their squad of five soldiers with precision against the insect-like alien threat, but as the game gradually increases in difficulty, you gain the confidence required to face the challenge. Leading your five soldiers to victory becomes a tug-of-war battle, where the tides of war are constantly shifting. One moment you’ll be laying waste to the alien hordes, and the next, you’re desperately struggling to defend your soldiers with everything you have. 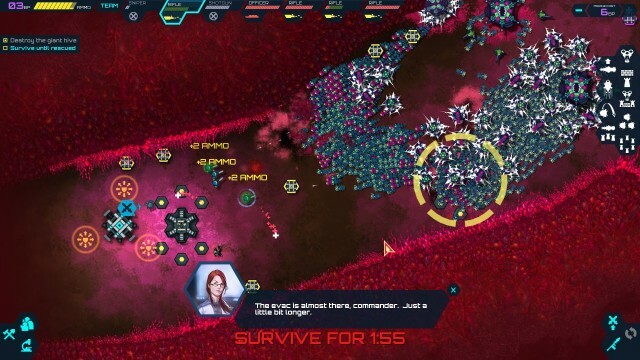 Infested Planet ensures that controlling your soldiers is simple, because when things get chaotic additional units would only complicate matters. Yet, the game manages to create a strategic depth that expands as you progress and complete missions that offer up cash rewards which can be used to unlock various upgrades. These range from the ability to call in helicopter strikes to obtaining weapon upgrades, medical pods and more. Upgrades that you unlock can be bought with the in-game resource, BP, that can be scavenged by acquiring crates scattered throughout the level or capturing enemy hives. Sure, these provide a significant boost to your survivability, but as you upgrade, the aliens evolve, too. Capturing alien control points, and the passage of time, sparks the alien threat to gain random evolutionary modifiers that seriously change the course of battle. In fact, I often found myself overwhelmed by an alien threat that felt insignificant at the beginning. The aforementioned mutations range from hardened exoskeletons, reinforced spitter turrets, randomly generating hives and even pods that mimic your own soldiers. These add a dynamic element to every encounter that offers an engaging level of tension and forces you to gain a solid mastery of what it means to command your squad. As the challenge escalates, it’s rare to find stagnant gameplay during your extended stay on Infested Planet’s alien world, even if you gain a mastery of the core gameplay early. Frequently, the game induces a fear of the unknown evolutionary possibilities of your enemies that creates an overwhelming feeling of anxiety, but this makes it so much sweeter when you overcome the seemingly impossible number of aliens that assault you. With an initial set of six training missions, players are guided gently into three distinct branching paths. The first sends you to the end of the story, while the other two separate branches offer their own randomized missions containing significant rewards. The small selection of stages in the game offer a basic variety of visuals that range from a bright purple interior hive system to a lively green jungle on the surface of the planet. All of these environments are sharp and crisp, however, it becomes hard to distinguish what types of soldiers you are commanding when your battles become chaotic. Luckily, the user interface makes it easy to quickly select specific units via a small bar menu at the top of the screen. Distancing yourself from the main storyline can prove a great benefit in the long run. In these randomized encounters, the reward is significantly greater than the main campaign. In fact, the final mission on the second branching path offers up a cool $250,000 that can prove extremely useful when tackling the game’s final missions. It’s important to note that I rarely found myself concerned with the game’s storyline, but it is there. What seemed most important was that I always had a reason to continue eradicating the infestation, as it was damn fun, even during the moments of frustration. Slaying bugs through the main campaign offers around 6-10 hours of gameplay, depending on your skill level. Luckily, Rocket Bear Games included a Skirmish mode that offers heavy customization options for you to get a quick fix. Additionally, Weekly Challenges offer a way for players to compete with their fellow strategists and attempt to claim the top spot. All in all, Infested Planet is a solid addition to the Steam community of RTS games. A fusion of tower defence and real-time strategy provides a fresh variation on a familiar formula, and the focus on player skill progression fuels the core tension of gameplay. Rarely will you find yourself bored with what the game throws your way. As thousands of the hive mind rapidly encroach upon your territory, you quickly learn what it means to adapt, or die.